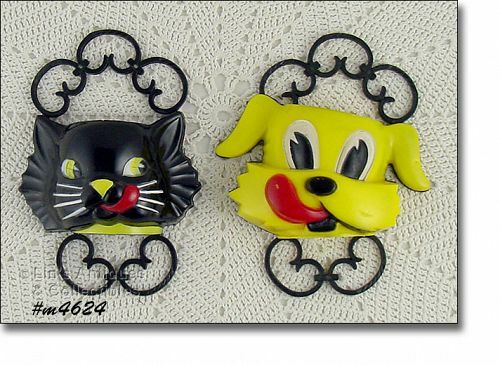 This listing is for Fifi and Fido wall pockets made by F & F Mold and Die Works of Dayton Ohio! They measure 4 ¼” (bottom to top of handle) and can be hung from the center loop in handles. Both are in great condition with minor color loss on facial features. Cute items! I purchased this lovely vintage embroidered item at an estate sale many years ago. I have just now laundered, lightly starched and ironed it and I find this is a very nice collectible item. The material used is from a plain feed sack and is muslin/off-white color. It measures 16 ¼” long and 10 ½” wide. The hem is hand done with a straight stitch. I purchased these lovely embroidery pieces at an Indiana estate sale many years ago and they have been in my needlework collection since that time. I had intended to have them framed but just never got around to it so am listing them for sale. 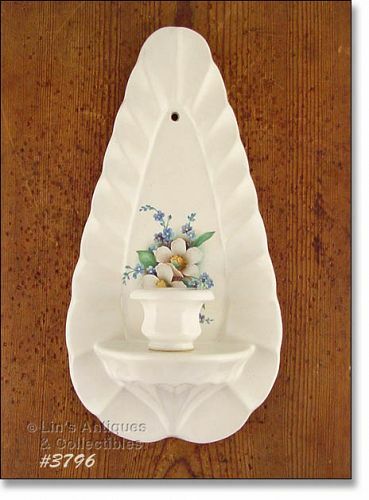 This listing has an excellent, like new condition Prayer Lady wall plaque! 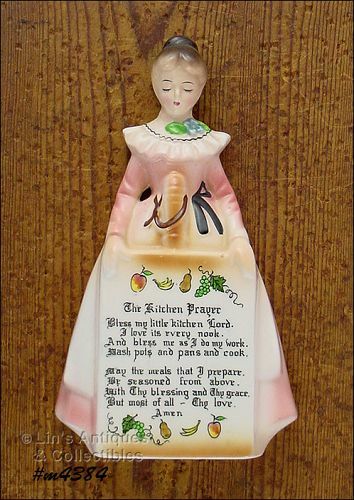 Made by Enesco, this line is known as Mother in the Kitchen as well as by Kitchen Prayer Lady. 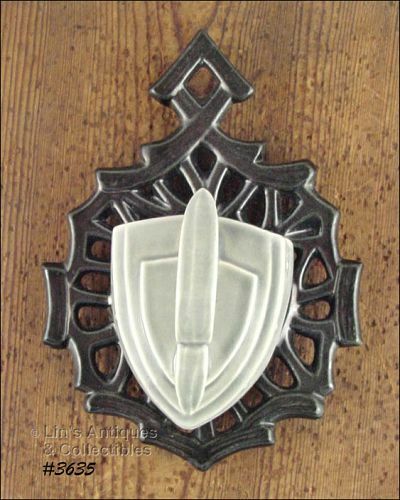 This wall plaque measures 7 ¼” long (at longest), 4 1/8” wide (at widest), back is stamped #-3349, and she still has the original Enesco silver and red foil sticker/label. She appears new and unused with no evidence of use or wear to the Prayer lettering. Outstanding item! Excellent condition McCoy wall pocket! This one is from the pretty Floral Country line of the 1980s. 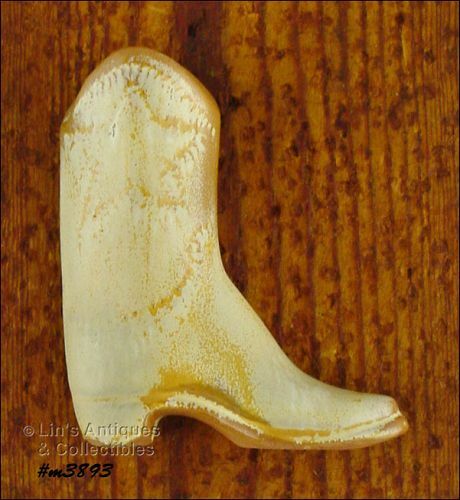 It measures 9 ½” long, top is 5 ¼” x 3 ½” – nice size, nice item!! 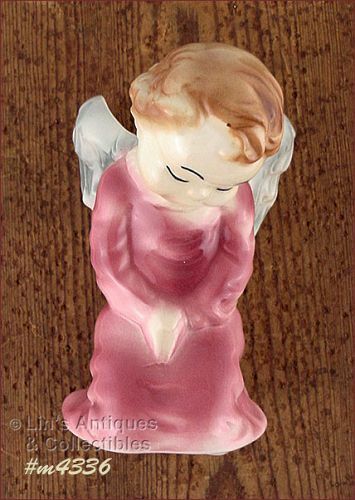 I am listing two of these Royal Copely angel wall pockets (this one and our #M4336) – both have been in my collection well over 15 years. This one is the larger size – approximately 7 ¾” tall (at tallest) and 5 3/8” wide (at widest). She has no evidence of use, just some crazing on back (not unusual with clear over-glaze) – that’s it! She has a hole on back for hanging but is also free standing. (I always displayed them on a bookshelf). Lovely item! 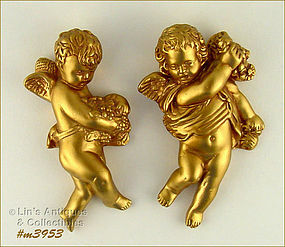 This is the other Royal Copely angel wall pocket from my collection! It’s the smaller size – measures 6” tall (at tallest), 3 ½” wide (at widest). There are no chips, dings, or evidence of “use”, just light crazing that is normal with clear over-glaze. Item is a wall pocket with hole on back for hanging but it is also free standing. Angel has beautiful detail with clear, crisp mold lines. Gorgeous! This listing has a cute chalk yellow dog wall plaque! Doggie is nice size – measures 6 ¾” from head to front toes and 6 ½” long (at longest). It is in very good condition with a few teeny flecks of missing color. Neat and unusual item! 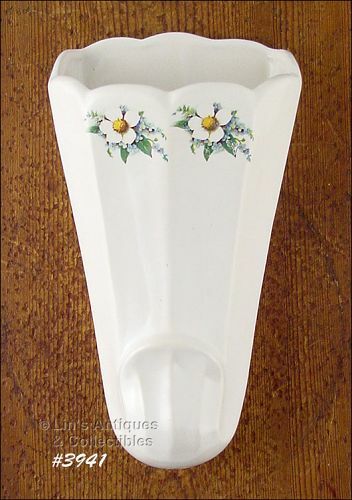 This is an unmarked McCoy wall sconce / candle holder from the pretty Floral Country line of the early 1980’s! 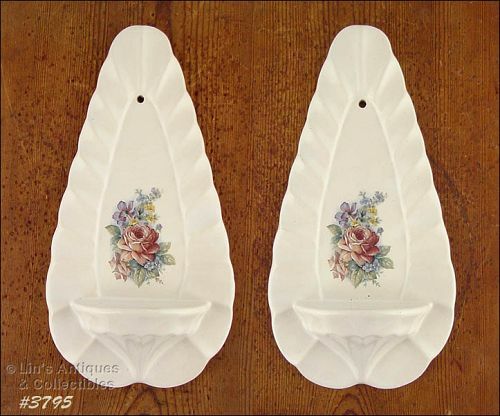 These unmarked McCoy wall sconces are very pretty and have a floral decal / decoration that is not your everyday find! Sconces measure 11 5/8” long (at longest) and 6” wide (at widest). They are in excellent condition – one has a couple production (under-glaze) dark dots just above the “shelf”. I have never seen nor had any other McCoy items with this particular floral design. Super items to add to a McCoy collection and to display. 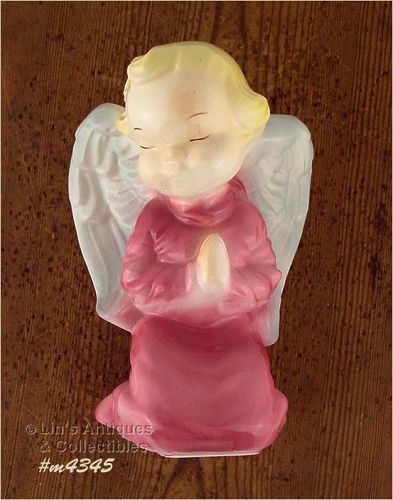 This listing has neat and somewhat unusual chalkware items – it’s a boy angel and a girl angel! They’re a pretty gold color, measure 7 1/8” x 4 ¾”, and still have the original metal loop style hangers in back. They are in wonderful condition with no chips or dings. Very pretty! 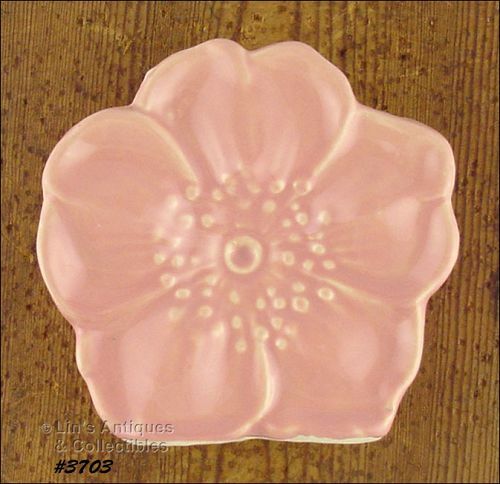 This listing has a McCoy flower blossom wall pocket in a gorgeous peach color! 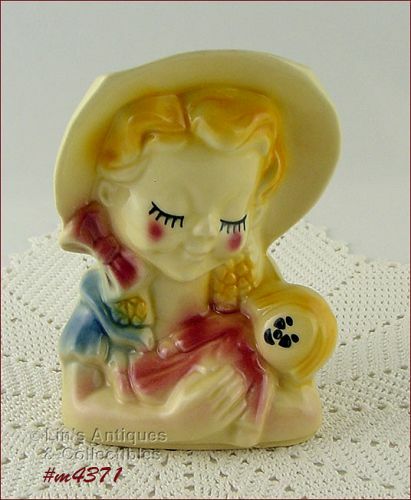 Produced in 1945, measures 5 ¾” tall, and is in super condition. There are no chips, dings, or cracks – the only “use” evidence is very faint (barely there) remnant of writing on bottom – not detracting in any way! 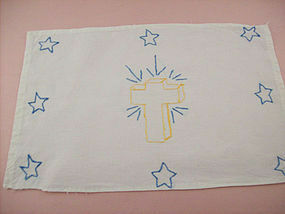 Excellent condition pair of child’s bedtime prayer samplers! These are cotton and measure 17 ½” x 12 ½” – they’re ready to frame and display or would make perfect gifts for a new baby! 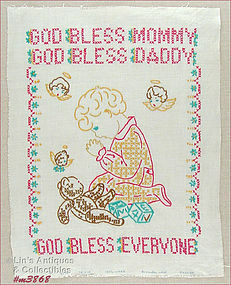 Excellent condition children’s bedtime prayer sampler! 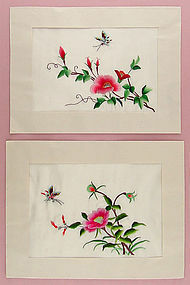 It is 100% linen and measures 14 ½” x 11 ½” – ready to be framed and displayed.